" LOS ANGELES (Feb. 20, 2017) – Live Nation is proud to present “Asia On Tour,” a multi-band tour series showcasing an exciting and talented new wave of Asian musicians. Promoted exclusively by Live Nation, the first edition will feature Miyavi from Japan,"
LOS ANGELES (Feb. 20, 2017) – Live Nation is proud to present “Asia On Tour,” a multi-band tour series showcasing an exciting and talented new wave of Asian musicians. 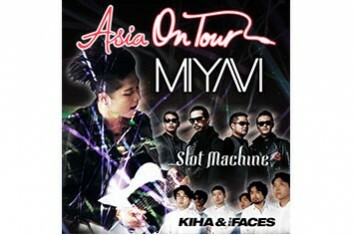 Promoted exclusively by Live Nation, the first edition will feature Miyavi from Japan, Slot Machine from Thailand, and Kiha & The Faces from Korea. These three renowned artists, who collectively have more than 4 million likes on Facebook and over 60 million individual YouTube views, are set to hit the North American shores this spring. Asia On Tour will kick off on April 1st and will visit 14 cities across North America including Vancouver, San Francisco, Los Angeles, New York and Toronto. Tickets go on sale Friday, February 24th at 10:00 a.m. local time on www.ticketmaster.com. A complete list of tour dates is below. Fans will also have the opportunity to follow the bands off-stage as Live Nation documents their adventures on tour, including rehearsals, backstage interviews and more. More information can be found on www.facebook.com/livenationasn. MIYAVI, the “Samurai Guitarist” – Japanese musician/actor/philanthropist – has gained recognition around the world for his unique “slap style” on the guitar. He’s had 5 successful world tours under his belt, and is releasing his new best album, Day 2, on April 5th, 2017 in Japan, which consists of his past 15 years of rocking out as well as revised versions and unreleased tracks. MIYAVI also has been showing his talent through acting in films such as Unbroken (2014), as well as starring in Stray, and Kong: Skull Island, which are going to be released this year. He has also been featured/endorsed by brands like Beats by Dre, Piaget, and Uniqlo, and is one the best artist to look out for in 2017. For more information, visit http://myv382tokyo.com/. Thailand’s leading rock band, SLOT MACHINE, with 6 albums already to their credit, are creating a buzz worldwide with the release of their first all English album Spin The World, produced by Grammy-winning producer, Steve Lillywhite. The band’s popularity isn’t just confined to Thailand; they have over 2M likes on Facebook and their cult song Khon has over 24M views on YouTube since being uploaded in January, 2016. Fresh from playing all the major Asian Rock Music Festivals including Japan’s Fuji Rock, Korea’s Valley Rock & Hong Kong’s Clockenflap to rave reviews, Slot Machine are primed to rock audiences around the world in 2017 with their energetic live show. For more information, visit Slotmachine.com. Known for their artful wordplay, talk-like singing, and sympathizing lyrics, KIHA & THE FACES holds a firm place at the top of the Korean indie scene. Their debut single Cheap Coffee became a massive hit in 2008 with their experimental yet familiar sounds captivating the masses. The band harmonizes the rhythms of the Korean language as well as combining the different genres of psychedelic, folk, funk, electronic, rock, and blues. For more information, visit http://kihafaces.com/.